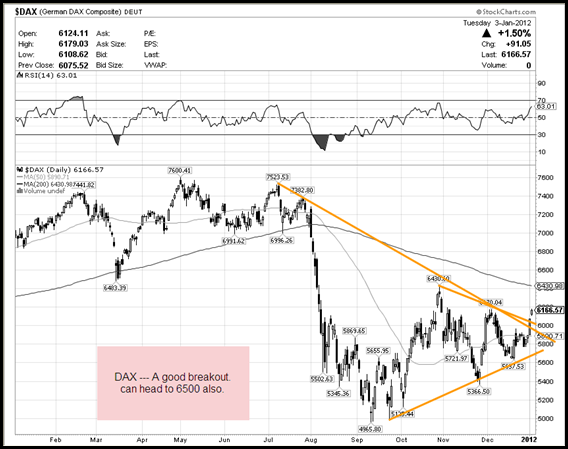 Although quite a lot of charts have given a breakout but given the magnitude of bounce from the lows we may continue to keep a cautious stance. On the flipside even if i were to be bearish this move can take out all stoplosses. 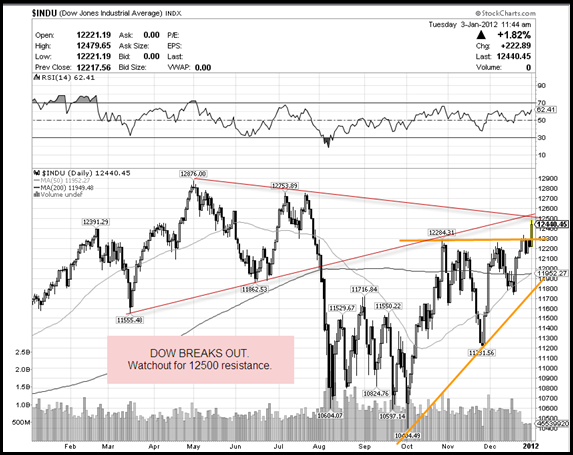 DOW as mentioned a few days back looks more bullish then bearish. We may now watch the 12500 resistance band. This cannot be surpassed so quickly. If does one may expect 13k also. DAX --- Another breakout which was signalled yesterday itself. 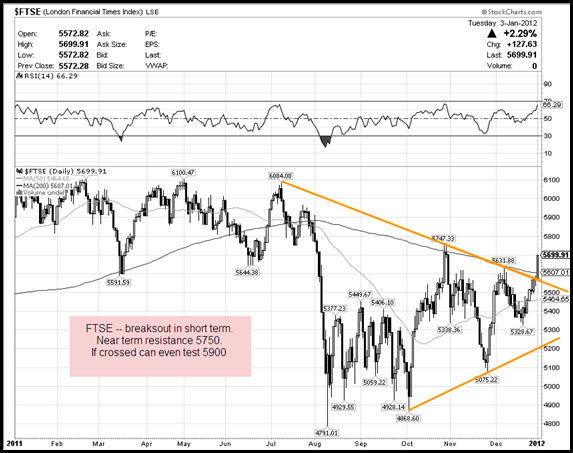 FTSE --- Strong breakout can head to 5750 and if that is crossed can even test 5900. CAC --- A nice breakout from triangle yet again. 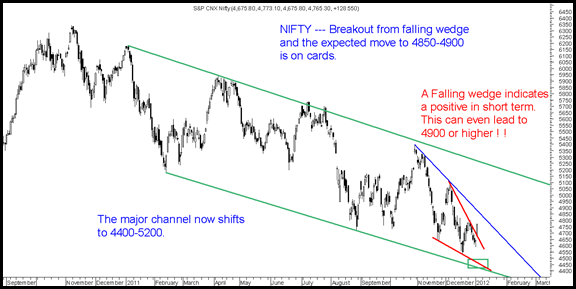 On the other hand Nifty / Sensex confirmed the bullish breakout from a falling wedge which was mentioned yesterday. It was clearly mentioned the bearish consensus is very high which is A good setup for a short term rally which can even surprise all the way to 4900 or more. This is the chart now. The blue trendline now comes to around 4900. We have booked partial profits today in the trades advised yesterday and today morning. We may review the stance at 4800-4900. Keeping with the simple rule. Buy the panics and book on rise. Sell when people become bullish. Many stocks could lead the bounce back and would not like to advise any as it may need quick booking. Such trades can be advised only in our Advisory Services. Also this week i am featuring on CNBC BULLS EYE program. 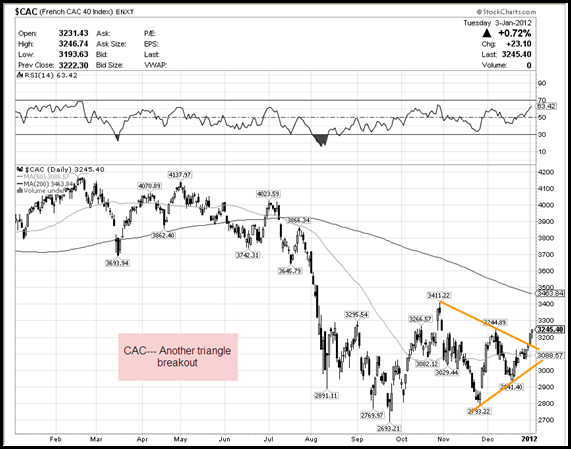 Now Learn Technicals From the Comfort of your Home/Office. 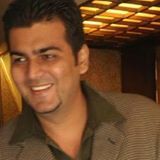 MUMBAI : 14-15th ( SAT-SUN) January ,2012. AHMEDABAD & DELHI : JANUARY , 2012.